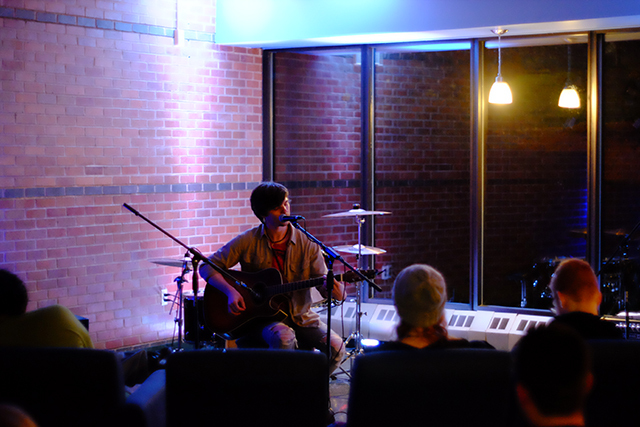 Tuesday’s stormy skies made for perfect open mic weather at the College Programming Board’s open mic night in Linden Lounge. Regular performers and listeners of Ramapo’s music scene hung out to share music, as well as coffee and tea. “It’s so fun to find transitions within the lyrics. It’s all from the heart,” Svechin explained while double wrapping his keyboard equipment in plastic bags to ward off the rain. Junior Ken Rapsas made several appearances throughout the night, experimenting with different song covers and originals on his acoustic guitar. His stripped-down slow-churned cover of Panic! At the Disco’s “This Is Gospel” was as chilling as the original. Rapsas’ charming conversational stage presence and personality are live essentials in tight-knit spaces like these. Later on, Rapsas accompanied sophomore Jacob Fishman to play the Front Bottoms’ college university anthem “Twin Size Mattress.” Fishman is a Music Co-Chair on the College Programming Board with a knack for singing soulful acoustic punk covers. Breaking up the countless guitar and piano acts, senior Tim Higgins majoring in theater and design technology, sang two karaoke covers. The first song was by the English dance electronic group Depeche Mode, while the second was by the Swedish melodic death metal band Arch Enemy. Flicking the switch from eclectic ‘80s to dark double bass beats was thrilling in itself. 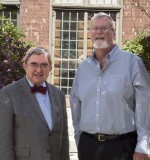 Higgins said, “The guy who helped me move in last year was the president of CPB and when he saw I had a keyboard and guitar, he said I should check out the open mics.” Higgins has been regularly performing here since then. Towards the end of the night, Fishman called for a moment of silence for the following day’s demise of the computer game “Club Penguin.” The game has been evolving with Generation Z since the year 2000. Thus, the website’s sudden termination is searing to the hearts of many longtime players. “3-2-1…okay rest in peace, ‘Club Penguin,’” proclaimed Fishman.